Gettysburg is well known as one of the most haunted locations in the United States. The site of one of the Civil Wars most tragic battles, the Gettysburg area honors the memory of thousands of brothers, sons and fathers. 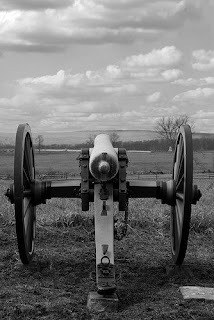 A drive through nearly any Civil War area will bring a sensitive person into contact with the spirits of past soldiers, and Gettysburg offers a high concentration of souls reliving their sad last moments. I have been through this area myself and found spirits on the battlefield as well as walking along the roadsides throughout Pennsylvania. The ghosts I encountered on the battlefield were looking for brothers or friends amongst the dead or trying to get home to their loved one. Sad and most likely merely echoes of the past fueled by extreme tragedy and sorrow. Whether you are a sensitive or not, the people of the Gettysburg area will share historical information as well as paranormal stories with visitors and tourists. The Black Cat tour or Patriot tour will give you a guided walk around the Gettysburg area introducing you to some of the most "popular" haunts. If you'd rather meander around on your own, here are some places to visit. Start at the Jennie Wade house. Jennie Wade is known to be the only civilian causality during the battle as she was while baking bread for troops in her kitchen. The wayward bullet found its way to Jennie and she could not be saved. It is said that her house, now a tourist location is haunted by Jennie, her sister and indeed even the soldier who inadvertently shot her. Then, move to Sachs Covered Bridge. This is the location of multiple hangings of soldiers and the site of apparitions and disembodied voices. Check it out after to dark to increase the fright factor. Stay at Cashtown Inn, the historic bed and breakfast that was once occupied by Jefferson Davis and troops. TAPS visited this location and found it to be full of otherworldly footsteps and cold spots. Make your reservations early. As with all locations, treat the area with respect as it is basically a cemetery for brave soldiers. Area's like Gettysburg, and through out the south, must be well populated with lost souls. I would think touring some of these sites would awaken most peoples senses. It's truly an area I would find most spiritual if I were to plan a road trip. It had to be an insane place in time... for so many.